Rarely do “simple” fragrances (scents with few ingredients or little development) hold my attention or gain my affection. I prefer perfumes that change their expression several times a day — perfumes that make a journey. The uncomplicated scents I do wear tend to be classic compositions made with rich ingredients (woods/resins, spices, incense or leather notes). I own several fragrances whose development is minimal: Christian Lacroix’ Tumulte (pour homme), Maître Parfumeur et Gantier’s Parfum d’Habit and Hermès Bel Ami. These warm scents begin with a glint, a spark, and settle almost immediately into a long-lasting glow — Narciso Rodriguez’ For Him is such a scent. For Him is fashion designer Narciso Rodriguez’ debut men’s fragrance. "This fragrance is the first extension of my men's wear collection," Rodriguez told Women's Wear Daily (May 18, 2007). "It is an important component of the total image, an expression of the man. For Him enhances the existing foundation of my vision for men's wear and is the first of many categories to come." For Him was created by perfumer Francis Kurkdjian and is composed of violet leaf, patchouli, amber and musk. According to Parfums Narciso Rodriguez Vice President, Nathalie Helloin-Kamel (also quoted in WWD), For Him’s inspiration came from an earlier era of men’s perfumery: “The benchmark was the great fougères of the Eighties." The fougère (fern) category of men’s fragrances is large — and diverse. Classic fougère scents attempt to conjure the aromas of cool, damp woodlands and contain ingredients such as oak moss, bergamot, lavender, galbanum, coumarin, and geranium. The grand-daddy of fougère fragrances was Houbigant’s Fougère Royale (1882). Fougère Royale predated another famous fougère by seven years: Guerlain’s Jicky (1889). Recently, a generous NST reader sent me a sample of the discontinued Fougère Royale; it is a marvelous scent. Fougère Royale contains bergamot, lavender, sage, geranium, orchid, heliotrope, carnation, rose, oakmoss, tonka bean, vanilla and musk. On me, this scent is dry and bracing, with a wonderful harmony created by the lavender, heliotrope, oakmoss and vanilla. I fell in love with Fougère Royale and immediately went into mourning. Why did Houbigant delete one of the most innovative, delightful and interesting fragrances from its product line? Over the years, the fougère category of fragrance has expanded to include fresh fougères, floral fougères, sweet amber fougères, spicy fougères, woody fougères, aromatic and even fruity fougères. Here’a a mini-list of Eighties’ fougères that may have influenced Kurkdjian as he formulated For Him — Calvin/Calvin Klein (1981), Drakkar Noir/Guy Laroche (1982), Tuscany Per Uomo/Aramis (1984), Boss/Hugo Boss (1986), Jazz/YSL (1988), Gucci Nobile (1988) and 1989’s Tsar/Van Cleef & Arpels. Two of my favorite modern fougères are Hermès Equipage and Balenciaga’s Ho Hang. Narciso Rodriguez’ For Him (in the Eau de Toilette form) possesses the sweetness of new grass, damp moss, and wet bark. For Him opens with a green “gust” of violet leaf. Violet leaf is refreshing and smells of young grass; on my skin it often produces a crisp and clean vegetal aroma reminiscent of watermelon rind and cucumbers. For Him’s opening smells grassy — with hints of moss and an accord that brings to mind lavender (leaf) and pine. For Him makes a quick transition from green notes to sheer woods and patchouli/amber. For Him’s amber, musk and patchouli are well blended, clear and soft — not too vanillic, not at all animalic. I’ve been wearing Christian Dior’s Jules over the last week and immediately noticed a resemblance between it and For Him; Jules is longer lasting and sweeter, but both fragrances possess a vibrant woody-green character. For Him is not a groundbreaking perfume, but it is nicely composed and a pleasant change from most recently released mainstream men’s fragrances; For Him doesn’t smell like a “department store” fragrance. (I’m hoping it will be a big seller over the holidays; I’d much rather smell For Him everywhere come Dec. 26 than the usual suspects: fresh-airy/marine scents.) For Him lasts on my skin for over 5 hours but its scent stays close to the body; it is a pleasure to wear a fragrance that smells powerful, yet doesn’t overpower a room. For Him can be worn by men or women. Narciso Rodriguez For Him comes in a 50 ml Fragrance Oil ($150) and in 100 and 50 ml Eau de Toilette sprays ($72/$54); the scent is also available in shave lotion, after shave emulsion, shower gel and deodorant. 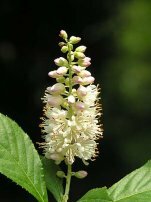 Note to Gardeners: if you love classic fougère fragrances, consider planting a Summersweet in your garden (Clethra alnifolia). The Sixteen Candles variety blooms profusely and the flowers’ aromatic scent reminds me of old-fashioned fougères like Fougère Royale. Note: Summersweet image by Will Cook at carolinanature. Sounds good! The patchouli doesn't seem to be to dominant and I like violet leaf. Equipage and Ho Hang: I'm totally with you! The latter is nearly impossible to find in Germany nowadays but I know it through a friend who knew it from the eighties and got it from the US. I always find it hard to recognise a fougère as such. So what is the difference to a typical oriental? How do I recognise a fougère for sure, like, is there a foolproof characteristic? Is Cerruti 1881 a typical one? Thank you for a great and timely review. I was given a sample of this one yesterday and was deciiding whether to try it or not. After reading your review, I have decided to give it a go later on tonight. My favourite fougere is Penhaligon's English Fern. Okay, comparing anything with Jules gets my attention. I'll give it a sniff next time I'm out. Thanks for the informative review. I see. Yes, a lot of so-called fougères don't smell green and herbal to me. One I can recognise and like as such is (“the first aromatic fougère”) Paco Rabanne Pour Homme. English Fern. There it's quite obvious, if it's even called “fougère anglaise”… I like it, too! This scent is getting a lot of hype on Basenotes – I can't WAIT to sniff it (someone is sending me a sample!). I tend to be drawn towards scents on the outer fringe of mens scents, but a classic fougere (like, Calvin by Calvin Klein) can still hit that sweet spot for me. I'm hoping NRFH will also. Have you sniffed the 'oil' (being marketed as Narciso Rodriguez Musc For Him')? I really wanna smell this one!! Thanks for the review Kevin!! I ended up trying it tonight Kevin and I'm afraid I had to go and take a shower to wash it off. It's a tenacious little devil, it took ages to get the smell to disapear. There is something in the notes that irritates my nasal membranes and I just wanted to sneeze. PBI: very interesting, as NR for Her has a very odd effect on me — literally can feel swelling at the back of my throat, and then I can't smell a thing for hours. Consequently am afraid to even try the men's NR. You know, my nose does get tired after a long day of sniffing too many fragrances, but the NR is the only thing (so far, knock on wood) that does it to me instantly. Whatever the chemical is that is causing the problem must either be rare, or be used here in much larger quantities than it is in other scents. Kevin, I didn't put on a full vial, but the spray came out like a hosepipe onto my arm. Robin, it would be interesting to see if anyone else has reactions to either of the NR scents. The only other scent that I have had a reaction with was Cuiron by Helmut Lang and that brought me put bright red on my neck wear I spraued it. Oh my gosh, I just couldn't stand this! I like a variety of scents, even some that others find 'repulsive', but NR for Him is a complete disaster in my opinion. Just smells like you're wading through a murky swamp on a hot, steamy day. I gave it a chance, kept checking it throughout its development, but no go. Sorry to those who like this, but this is one of the worst fragrances I've ever smelled. NR for him reminds me a lot “Bandit” from Piguet … ! CBG: tastes vary…the smells of a murky swamp on a steamy day are nice! (I've been to Dismal Swamp in HOT weather and loved the aroma). That being said, NR, alas, just smelled like a sweet ole fougere to me. xxerus: REALLY? To me, Bandit has a TON more personality and oomph. Yes, I completely agree with you : Bandit has a much more interesting identity & signature (and this is why I wear it). NR is of course VERYsimple compared to it, but you can fin in both base notes dirty, agressive, dusty and animal notes. And of course, the comparison ends here ! Kevin, thank you for a very informative review!